You can now operate this great intercom system even safer with a remote control which can be fitted to the handle bar or handle bar grips. (bushings/hardware supplied). This simple and innovative device makes using the device that much easier & safer allowing you full control without even taking your hands off the motorcycle grips. * Controls: volume up & down, reset, phone/play, power/interphone A, BCD buttons. * Other A2DP, EDR & HF Bluetooth profiles. * 4 buttons labelled A B C D so you can quickly switch from rider to rider. * Only uses power when you push the buttons, which should last 2-3 years. Simply replace watch type battery when required. Hifi Speakers - We have upgraded to slim 5mm Hi-Fi Stereo Speakers with waterproof clip speakers & 2 microphones (boom & velcro wired). The sound & comfort performance has increased more than 200% from previous versions. Because its so slim with a felt padding you can now put the speakers against your ear without compromising comfort. The sound quality is still very good if you choose to put them behind the padding. The speakers themselves bring alot of value to this kit. We have tried and tested other speakers, they dont even come close. Expect to see this quality in a $380+ kit nothing less! Remote control - is now rechargable, no more replacing batteries. The signal strength to control the intercom unit has been increased. * If playing music, phone calls take over. Music will continue once the phone call has ended. * 3.5mm audio plug & cable are included; simply plug in your MP3/portable CD player/IPOD etc. Detailed instructions are in the provided manual, if you need any help please dont hesitate to email/call we will gladly assist with any questions you have. We recommend using the bolt on headset mounts instead of the stick on for extra security. 1 x New: Remote control with new to 2013 rechargable option & increased signal strength. Attaches to your handle bars & controls the headset (includes all hardware to fit all motorcycle handle bars and handles). 1. "For the past two years I have been looking for bluetooth helmet speakers that can give me sound quality similar to that of my ear bud headphones. Having trialed at least 5 different types, I have to say that I have finally found what I am looking for. The speakers that you have supplied are absolutely fantastic. Not only are they comfortable in my helmet, I can now listen to music without the terrible "tinney" sounds of the others that I have tried. I can hear base, treble and mid sounds clearly and now enjoy my music at over 100kms p/h." 2. "very good units nice an compact crystal clear head sets x4 happy people"
3. "These are fantastic tested very clear range @ no less than 400m in traffic"
All of our items come with a full money back satisfaction gaurantee for 60 days. Purchased the intercom on a Monday and arrived on the Wednesday. Great service. As for the intercom it was easy to install and works well for a budget priced set. Whilst not the prittiest Motorcycle intercom on the market; at half the price of the market leader, this is more than acceptable. The initial in helmet installation and set up was easy to follow and pair with my phone. Speaker quality is exeptional, clear with a good musical reproduction. Hands free phone calls and intercom use was also very good quality. I am very happy with my purchase choice and recommend this product should you be in the market. When our Scala Rider system died (it had cost around $700) and it turns out that the battery could not be replaced we looked around and found the Finn R4 for less than half the price. It was a little fiddly to fit but has really great clarity, way better than the Scala unit. At high speed it is predictably not 100% but still just fine. I love the handle bar control unit (you don't have to use this but I do) which comes as part of the package. Easy and safe to make adjustments.... Best of all you don't pay fancy brand prices. Oh yes, Matt has been amazingly helpful and available... this is a pretty rare level of service these days, a real human who cares! I called Matt and had a good chat to him about the R4 before purchasing this and he was very friendly and accommodating. He even rushed a shipment out just before going on leave himself. Sound quality is great and it's pretty easy to setup. Only once or twice have they dropped out, but a simple reset and they're back online and good as new. Excellent sound when playing music if i'm riding alone and phone calls are clear. When i have my Mrs with me, chatting away is easy with no interference from wind (we do have full face helmets with the boom mic) even travelling at 100+km. 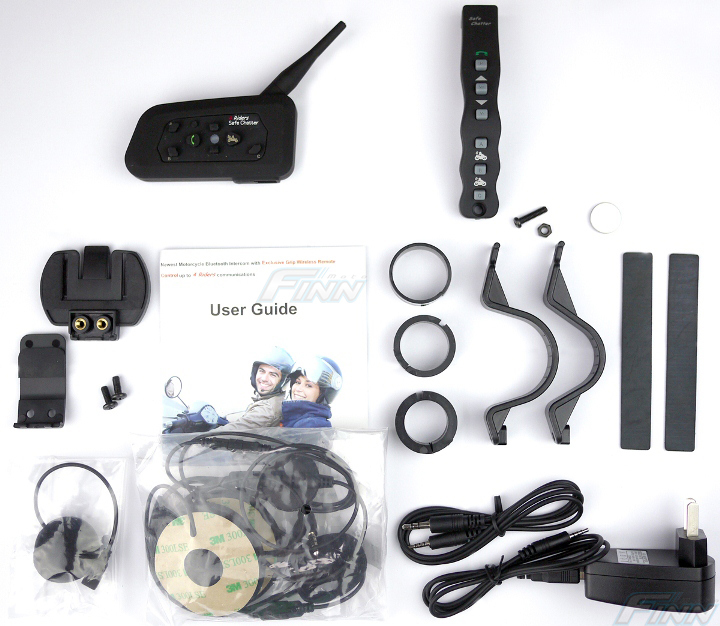 I was searching the Web and reading reviews on motorcycle Bluetooth intercoms (Interphone, Sena, Scala, Uclear, all pretty expensive), when I came across the R4 from Finn Moto. Rang Matt, verified a couple of things and placed an order online 22 July at 2.00pm. Package arrived in Adelaide 10.00am next day via Express Post. Impressive. Instructions are reasonable. Usual Chinese to English translation chuckle gems. Charged the RCMI and remote, and installed the set into my full-face helmet that evening. Very simple, although (and as mentioned by another reviewer) the mouth piece microphone Velcro tabs aren’t sticky enough to stay put. Not helped by that area on most helmets being slightly curved. I’ve since used a dab of silicon on both stickies, issue solved. Note: Dry fit the speakers first, and sound test, to make sure that they are positioned ‘exactly’ over the ear to achieve optimum sound quality/loudness. Remote control is designed to fit hard against the inboard flange of the left grip. It can interfere with the operation of the indicator and horn switch (but only slightly), now used to it. If mounting elsewhere on the bar make sure that the 2.5mm charging plug port can still be accessed. With the set installed and paired to my Galaxy S5 I went for a ride listening to music via the phone. The sound quality is very good, and loud and clear enough at 100 kph. Similar reproduction to reasonable quality ‘in ear’ headphones. The system also responds to equaliser settings (bass/treble), if available on your device. Incoming phone calls paused music playback and auto answered in 4-5 secs as specified. Conversation (both ways) at 100kph was quite acceptable. Music auto recommenced after call termination. If using the supplied 2.5/3.5mm audio cable with an IPod or similar to listen to music/radio note the following. RCMI needs to be powered up (blue light flashing) and any paired phone DISCONNECTED, with Bluetooth OFF. Connect IPod via cable and play music/radio, then WAIT 10-12 seconds while the RCMI works out what it needs to be doing. You should hear a series of beeps while it tests profiles (phone, intercom, music) before hearing anything. Once playing, rechecked device volume level as it seems to auto-reduce volume when changing profiles. If you reconnect a phone to the RCMI via Bluetooth at this point, playback from the IPod will cancel. Connected R4 intercom with a mate’s Interphone F5MC using the Interphone’s AnyCom’ feature. Worked very well, good line-of-sight range, and auto reconnects after being out of range. Overall very happy with the set, and EXCELLENT customer service from Matt and Finn Moto. Great value for money. With a 60 day money-back satisfaction guarantee you almost can’t go wrong. Very easy to use. Paired the R3 & R4 and it worked straight away. Sound quality is pretty good, even at high speeds. I actually charged up the remote, did it overnight. The next day, with the remote still mounted on the handle Bar, I did not have to sit forward to get in range when using it. I could sit back and press the remote buttons for instant effect. Wonderful system, the sound quality is excellent. and Mobile phone usage works well. thanks Matt and Finn Moto, I am happy as. Well must admidt suitable impressed. Owner of Scala Rider Previously many moons ago, I was use to similiar Blue Tooth products. Going for a bit of a weekend Bash with a group of fellow riders (Darwin to Kununarra, Moon Festival) on the 22 May 2015. Was going to save some expense and jsut wear headsets on my I phone 4. but thought it may get a little uncomfortable, plus loose communication with other riders and pillions. Wife riding, me carrying a pillion. So hunting around, I searched the market for the best price. Found Finnmoto.com.au saw that they had a bluethooth system. Liked the price so contacted the stated phone number and spoke to Matt. Initially a little taken aback how young he sounded, but all the questions i asked him came back with good and relevant answers, I was going to go for 3 x 3 rider, but he advised that I get 1 x 4 Rider and 2 x 3 rider. Because I was embarking on the weekend trip the following weekend I asked if he could send them to me straight away. I then went back into the ordering process on Finn Moto and order a dual set 4 Rider and 1 s 3 Rider. The Sets arrived within on Wednesday, having ordered on Monday. I installed the sets into the helmets Wednesday night. Very Quick and simple, although the mouth piece microphone, sticky Velcro tab was very sticky, thus not staying on the microphone, and this appeared to be constant with all through sets. So have had to use some black masking tape to stick the mouthpieces to the Helmed (2 Microphones are supplied with each set, (one with an arm, one without an arm), the microphon e's with the arm, were the ones that had the non sticky backing on the Velcro Tab. With the sets installed in the helmets (having charged eachset for 3 hours) linked the bluetooth phones and went for a ride listening to music. WOW! the sound was excellant and constant at 120+ kph. I was wearing earplugs, and have a fairly noisy helmet but the sound quaility was just great. Found that although I was linked to the phone by Bluetooth, the phone was not coming through the headsets or picking up on the mike at first! playing around with the phone and the setpiece it worked. Not sure what the issue is on that at first, it works but on initial use it doesn't Just operator/ set up error I think, (iphone 4) ? 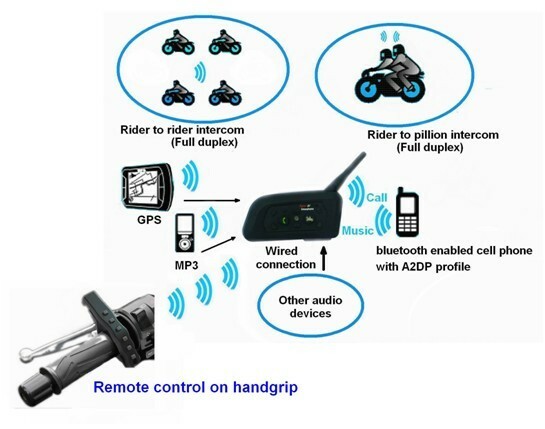 The remote control is a little bit difficult to install on 1" handlebars, (I believe it is designed to be put on the hand grip, but not sure that suits me, large hands). It would probably be better if there were two screw up areas rather then the single area. I am finding that where I have positioned the remote, the range doesn't appear to be that great, thus I have to lean forward for it to operate (ie come into range! I ride a Triumph Bonneville T100. and my bars are dropped), so I will play around with the remote and put it in different positions, I may try to locate it on the Tank bag. Forgot to mention that the hand remote worked really good and improves the safety for the rider and pillion. The ease of using the intercom is 100 percent better than trying to find the right button on the helmet mount. I purchased two units one for myself and one for the wife (pillion). I mounted my remote on the handle bars and the wife stitched a band on hers and wore it outside of the gloves. Both of us consider the remote is an excellent addition.